North Korea will launch more satellites into orbit despite international objections, the country’s leader Kim Jong-un said during a visit to a newly-build space command and control center. "The status of the (North) as a satellite producer-launcher remains unchanged though the hostile forces deny it and its space development can never be abandoned, no matter who may oppose," Kim was quoted as saying by state-run KCNA news agency. The new, 13,770 square-meter center is reported as having the necessary equipment for real-time space mission control, instruments for space launch monitoring and an electronic data archive, research labs and other facilities. Kim has stressed that the North will continue its efforts to become "a space power.” He urged to "provide more cutting-edge facilities for the center, build a base in which a satellite test can be done and erect something symbolic of the center." North Korea has conducted four space launches under its Kwangmyŏngsŏng satellite program. The latest in December 2012 was successful. 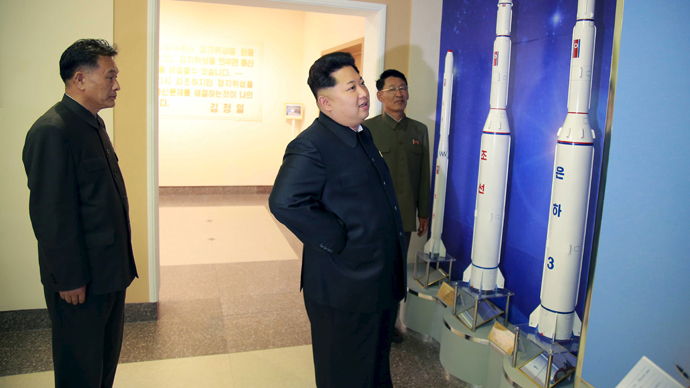 Pyongyang insists its space program is legal and purely peaceful. However, launches of ballistic missiles by North Kora are banned by a number of UN Security Council resolutions that were imposed following its nuclear tests in 2006 and 2009. Critics say Pyongyang is merely testing ballistic missiles with a goal to develop ICBM technology as part of its space program. North Korea previously claimed it has developed long-range ballistic missiles with a range allowing them to target the US mainland with nuclear weapons. Defense experts doubt it, and say DPRK has a long way to go to develop missiles with long enough range, and to miniaturize its nuclear devices enough to fit into a warhead.